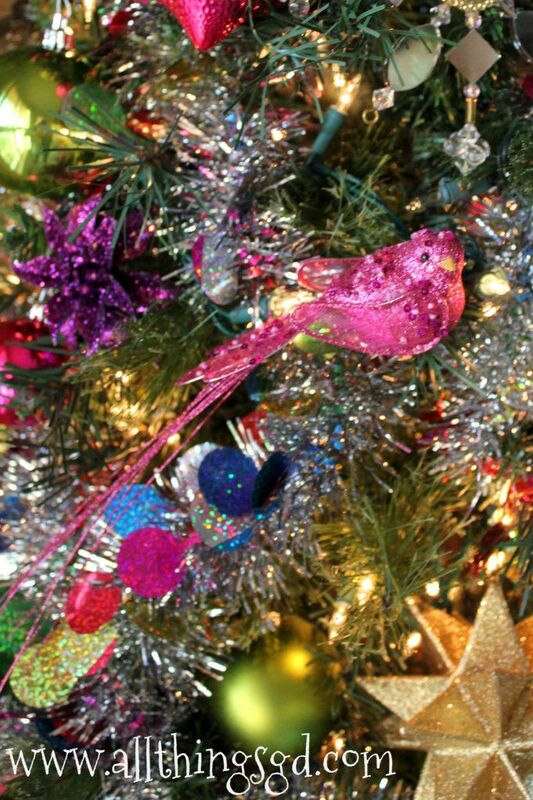 I would start decorating for Christmas on July 5th if G would let me. Unfortunately, he insists that I wait until after Thanksgiving to bust out the Christmas cheer. In recent years, however, I’ve taken the liberty to interpret this to mean “after we eat turkey in November,” so once we get home from our family’s Thanksgiving dinner, I’m plugging in twinkle lights and popping in Love Actually. Last year, I was thrilled to thrill Kate with the joy, magic, and surprise of waking up to a beautifully decorated Christmas tree the morning after Thanksgiving, and I was giddy with excitement over doing the same again this year! As I was pulling our (ahem…artificial, pre-lit) Christmas tree from its box that evening, I joked with G and my sister Brittny (who had recently arrived) that every year I say a little prayer that the tree lights up. My pre-lit tree, slowly committing suicide over being stored in our basement. Twenty minutes later Brittny and I pull into the last remaining parking spot at Wal-Mart, and twenty minutes after that we leave empty handed and scarred for life. Wal-Mart on a good day gives me hives. Wal-Mart on the night before Black Friday?! That twenty minutes is now going to cost me two years in therapy. And Kate still needs a tree! I decide to make our half-lit pre-lit tree work by stringing fresh strands of lights over the unlit parts and crossing my fingers that tinsel and tons of ornaments hide its flaws. 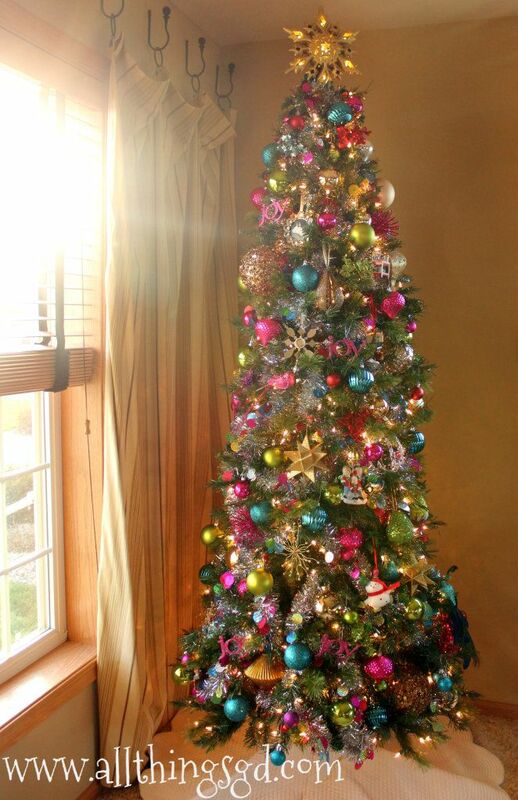 I decided last year to bring some color to our Christmas, and I’ve continued that trend this year with our (even more) colorful Christmas tree! New this year – a cupcake for Kate! 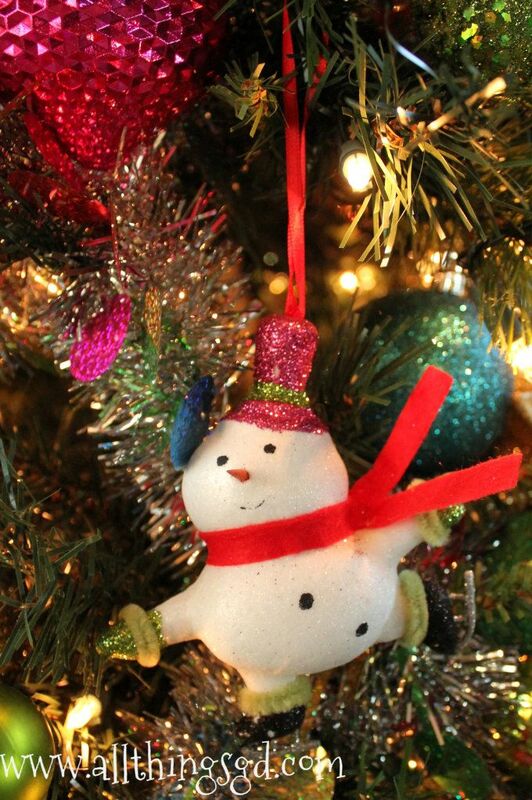 No one’s having more fun on our tree than this guy. Kate is just as much of a Christmas junkie as am I, and her excitement can hardly be contained when she sees the holiday decor section at Target. The last time we were there she tried talking me into buying a 6 foot tree made entirely out of tinsel. 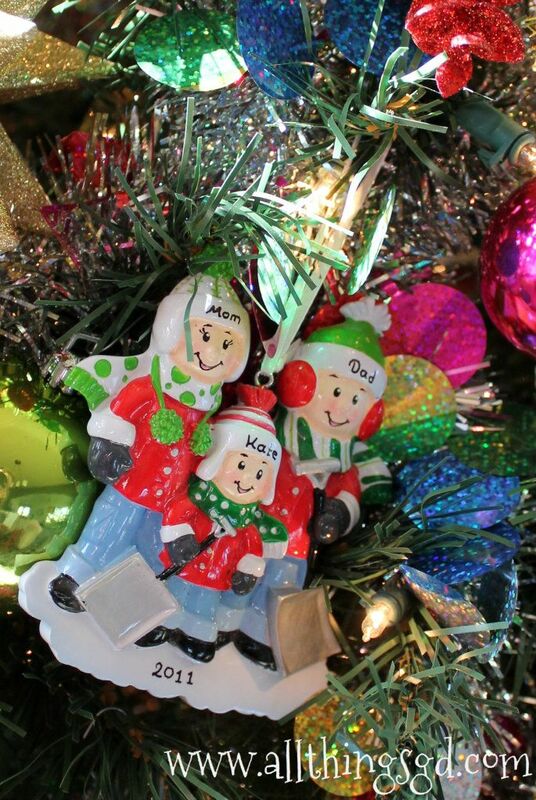 Kate’s favorite ornament this year. Loads of ornaments = loads of love! 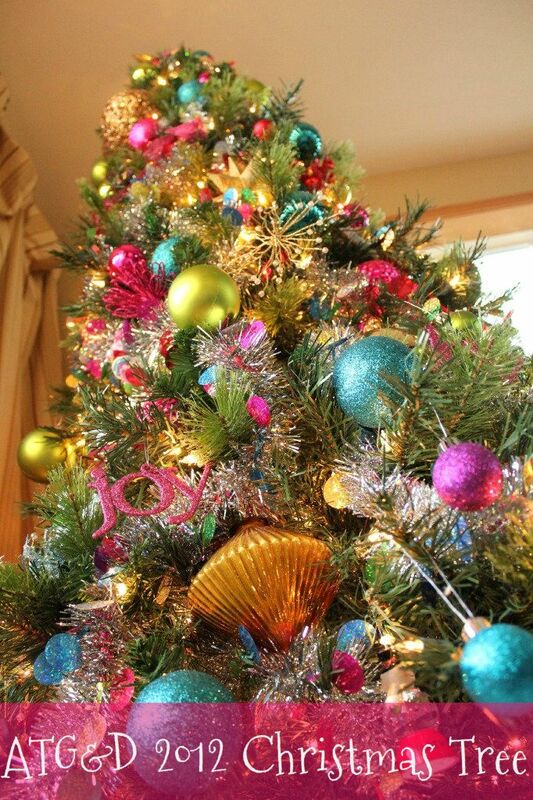 No matter how our ornaments are arranged, and no matter if it’s day or night – we love our colorful Christmas tree! …and glowing proudly at night! Anybody else looking at a therapy bill that rivals your child’s college tuition fund for venturing out on Black Friday? Maybe we could get a group rate. 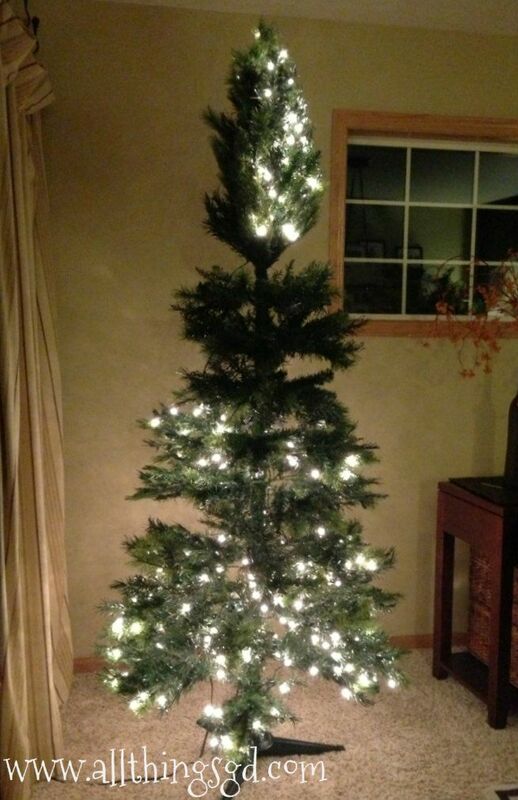 Gosh, your tree is beautiful. And if possible, even more beautiful during the day! Great job!! You are a brave, brave soul. I went to Walmart on Black Friday but I arrived at about 3 pm and it was a ghost town. SO, so pretty! 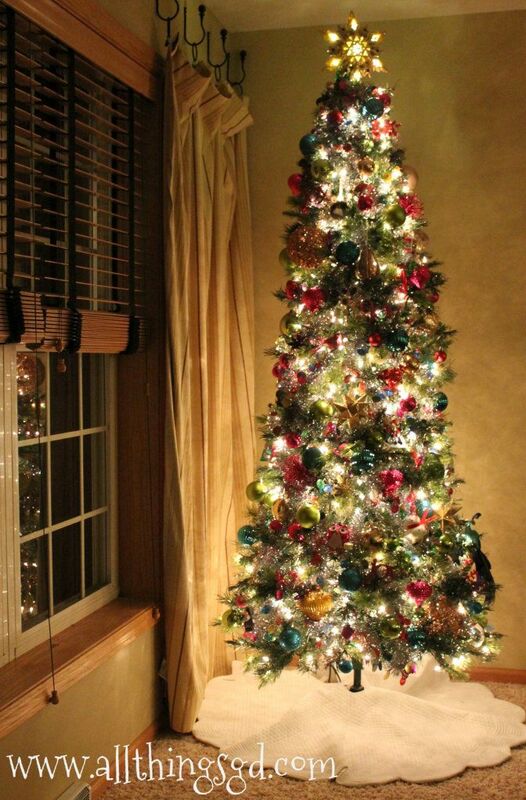 I still see gold/bronze/silver stuff and think of your tree, pfft, that was so three years ago! 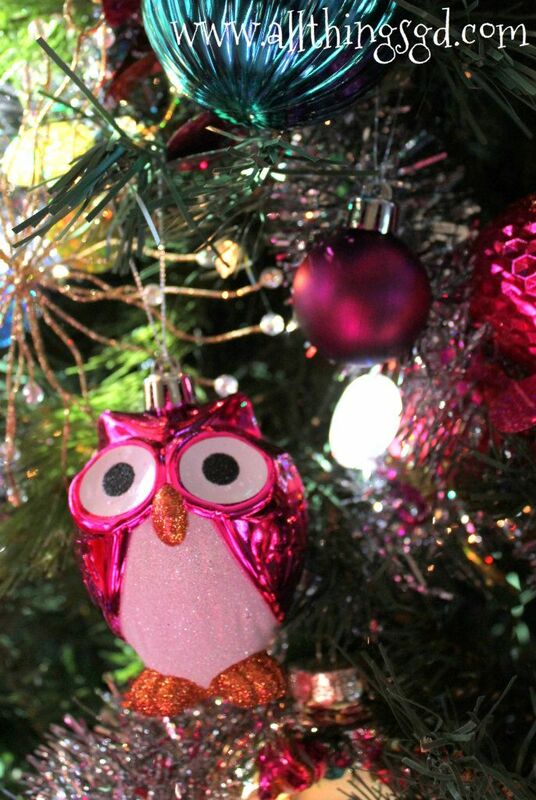 I have the same owl ornament (3 of them) in silver…they are so cute!!! Love your tree! My mom and I went to Wal-Mart once at 5am for Black Friday. I left empty handed and yes, scarred for life. That started my moratorium on going to Wal-Mart between Thanksgiving and Christmas. We had to go this year because my husband HAD TO HAVE light up candy canes for the yard and Home Depot was out. We went at 6pm and I was braced for the worst. It wasn’t half bad. I made the mistake of going to WM 10pm Thursday. Also walked out empty handed and scarred for life. My camera died and thought I could find their “doorbuster” camera. I ended up finding the camera online today as a Cyber Monday deal! Never again, I’ll just wait til the deals show up online next time. I love your tree. You did a wonderful job. Katie will remember this tradition and treasure it. 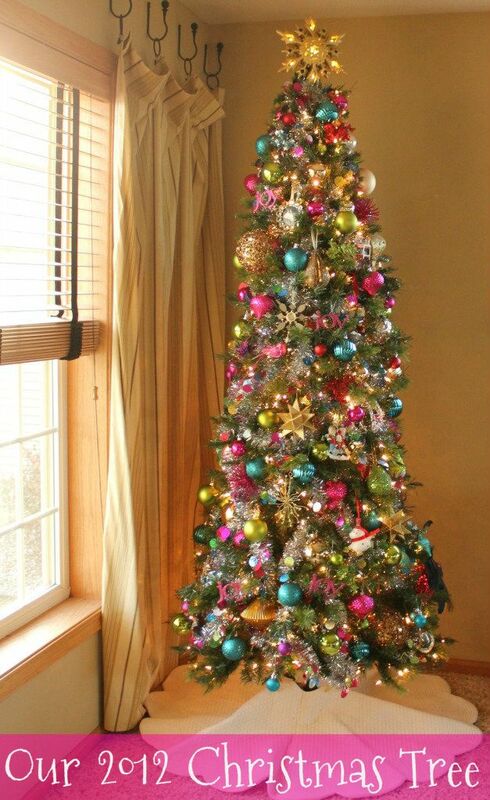 Gorgeous tree! I cannot stomach Black Friday at Walmart. Just thinking about it creeps me out. The crazy crowds, the lines…I’d rather pay full price. @Beth: So happy to hear your experience was better than mine! @Allison: I still use my gold, silver, and bronze ornaments – only now they’re more like accents than the focal point. I still love them, though! @Carolyn: We drove past SuperTarget at 8:30pm and there was a huge line of people wrapped around the building. Crazy! @Kristy: Oooh, your yard candy canes sound so adorable! Those were well worth the trip, I’m sure! @Doris: I hate shopping in stores on a regular day, so I’m with you on waiting until Monday for the online deals. Hope you scored some good ones yesterday! Hilarious! When I was in college, I worked in the photo dept at WalMart–and I had to work 5am Black Friday. THE WORST experience and I will never do it again! I haven’t been out shopping on Black Friday for YEARS–and this year, hubs and I decided to go. We made it to ONE place before we turned around and went home. No way. It’s not worth it! Love your tree!! So pretty! 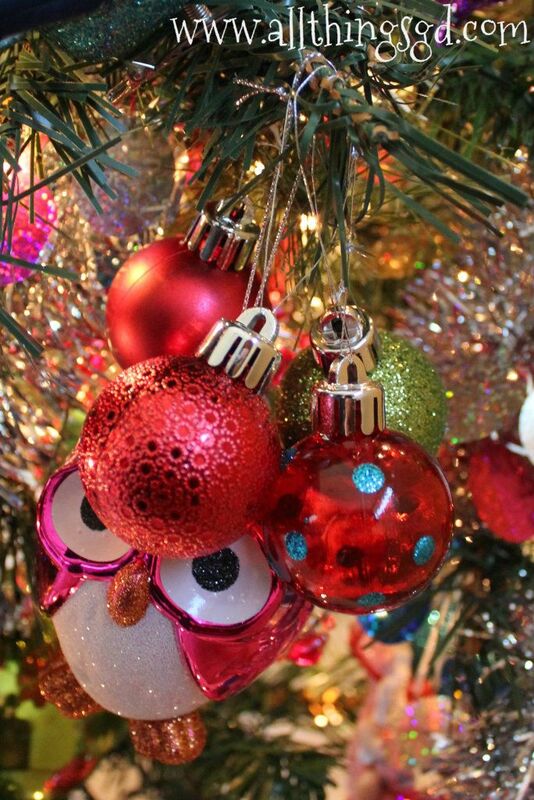 I love all of the colors and the cupcake, snowman and owl ornaments. I must find them! And you are brave going to Wal-Mart on Black Friday. I avoid that place like the plague. Thank you, Julie S! And I agree – Black Friday is totally not worth it. @Amber: Thank you so much! 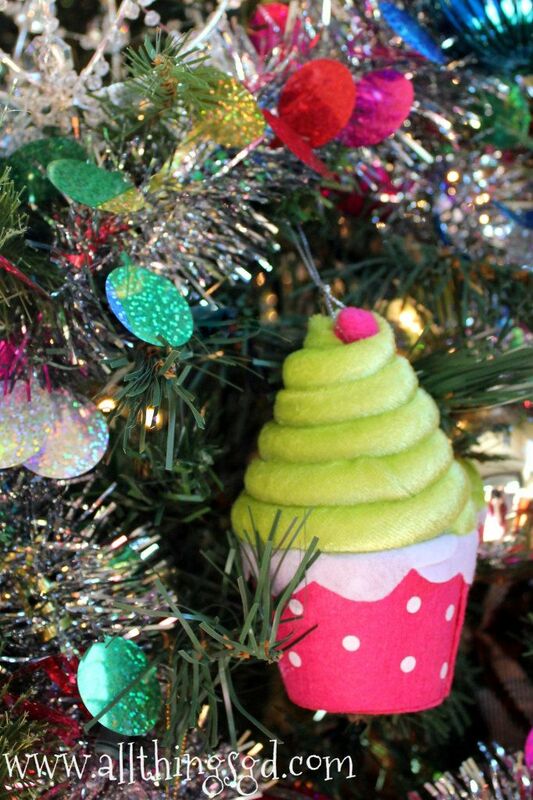 The owl ornament is from Target and the cupcake is from WalMart. I think the snowman is from Target too, but we got it last year; I’m sure if they have it again this year. Happy shopping!